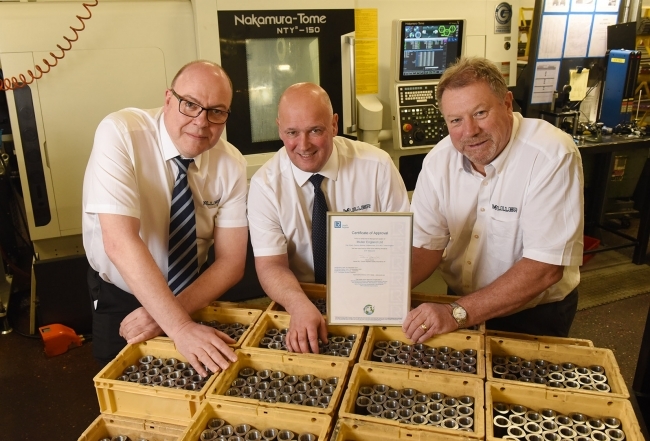 A leading sub-contact machining specialist has become one of the first manufacturers in the UK to secure a prestigious new automotive quality accreditation. Muller Holdings, which employs 90 people at its headquarters in Shropshire, has achieved the International Automotive Task Force (IATF) 16949 standard, a standard that is now being used by the main car manufacturers and tier 1s when awarding new contracts. This replaces the TS approval and is vital to the company’s desire to build on over £7m of orders it currently holds supplying CNC machined and high volume parts for use in heavy duty braking systems, engines, electronics and door brackets. The process took just twelve months, from initial planning to mobilising the quality team and ensuring that everyone knew what was expected of them to ensure the 21 changes in specification were successfully met. “IATF replaces TS in September and is a lot more risk based, covering risk evaluation and analysis within all aspects of the business,” explained Stephen Lock, Managing Director of Muller South Wales. The firm is part of the Manufacturing Assembly Network, an eight-strong group of sub-contract manufacturers and an engineering design agency who work together to win orders and share best practice and resource. The collective, which enjoys more than £70m sales and employs over 750 people, can offer every engineering discipline imaginable, including automation and control systems, casting, fabrication, forging, plastic injection moulding, PCB development, precision machining and high volume pressings.